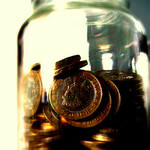 A relatively easy way to build your savings account is keep that small change to grow a big savings. Take the loose change that is constantly laying around the house and the never ending purse full of coins and start a small savings jar. The first $9.87 collected will soon become $90.87 and continue to build. It’s true, the little things make the biggest difference. This is a little action you can take each day and remind yourself that this is money and this does count towards building your financial future. –Unplug it! “Vampire” electronics consume power even when turned off. A typical household can save $100 a year using smart power strips, which cut electricity to devices in standby mode. –Install a low-flow showerhead. You won’t even notice the difference, Vila says, because a low-flow fixture reduces the volume of water, but does not affect the water pressure. –Learn when new gadgets come out, so you don’t buy something just before it’s made obsolete. In general, a new iPhone model debuts each September, and a new iPad every November. New cameras come out in February and October, and everything else is timed for the holidays. –Consider a prepaid cell phone. You pay before you make calls, instead of after you’ve made them. –Talk to far-away family members using an app like Skype, which is available for smartphones, tablets and computers, or Face Time, for Apple phones, tablets and computers. You chat for free over the Internet. –Shop around for insurance. Auto insurers have a tactic called “price optimization.” They raise premiums based not on your risk factor, but on how much of an increase they believe you will accept. When it’s time to renew, ask your current insurer to do better. –You can get your credit score for free at creditkarma.com, and credit.com. –At what age should you start collecting Social Security? The magic number is 80. If you’re single and you think you will live past it, wait until age 70 to begin collecting, to receive the maximum benefit. For couples, as long as you believe one of you will live past 80, the higher earner should delay as long as possible. –Switch to generic drugs. The price is usually lower, as well as the copay. –Don’t smoke. Cigarette smokers pay more for insurance and require more medications and doctors visits. Cigarette smoking costs the United States up to$333 billion annually, including at least $130 billion in health care costs. –Ask about independent facilities for radiologic tests. Having an MRI at a hospital costs an average of $1,200, but the same procedure at independent radiologic facilities costs about half that. –Take advantage of wellness benefits. Many employers offer incentives for participation in exercise and other health programs. –Take your medications regularly. Many costly hospital visits are for conditions (like asthma or high blood pressure) that were managed well with medications until they worsened when the patients skipped doses. –For cheaper flights, look to the earliest and latest flights of the day. –For weekend travel, stay in a business hotel. The road warriors are gone and so are the high prices. These hotels will be in the business district — which isn’t always the most vibrant part of town — but that’s a small trade-off if you’re getting a good deal. –Avoid conventions. Cities such as Washington, D.C., Las Vegas and Orlandohave the best hotel rates when conventions are not in town. Check out a city’s official tourism website under Convention Calendar to spot the best times for a visit. –Head to ski resorts in the summer and beach locations in late August or early September. –If hotel rates seem sky-high, there are often cheaper, legitimate alternatives. Consider finding a room at sites like homeaway.com and airbnb.com; you’ll pay less and feel like a local. It’s time to use these tips and savings advice and start generating your own savings account for a better financial future.